Brookfield Central's baseball team came back from a season in which their team resembled a M.A.S.H. unit more than a baseball team. Senior pitcher Michael Hinz, who bounced back from an injury, was perhaps one of the main reasons for it. The Lancers tied for fourth (11-7) with Menomonee Falls and finished with a 20-12 overall record. Central won the regional title, but lost to Waukesha North, 4-1, in the sectional semi-final. Leading the way was Hinz, who finished with an 8-1 record and a save, with 5 quality starts and 3 complete games in his 11 games. In 52.2 innings, he fanned 35 hitters, walked 20 and allowed only 7 earned runs, finishing with a 0.94 ERA. "I was pumped. I couldn't wait to get out there this year, especially missing last season (broken right index finger)," Hinz said, looking back at the Lancers (7-24, 5-15). "I was extremely excited to get out there and play again. I knew we were going to be better than teams thought we would be this year and that's how it turned out. "I'm extremely happy with my season," said Hinz, the Lancers' only first-team All-Greater Metro Conference selection. "I know going into the year, our goal was to just be above .500. We surpassed that right off the bat. We had a huge win against Tosa East (1-0, 10 innings) early and it just took off from there. Our hitting came around and the pitching was just great. Our team ERA is insane (2.36)." Veteran Central coach Jeff Bigler talked about what Hinz meant to the Lancers. Bigler knew Michael would be something special. "When he came up as a sophomore and pitched a few non-conference games for us, we knew he had a lot of talent," he said. "He has a big frame, a lot of leverage, long arms and we really touted him as a prospect. That's why we brought him up as a sophomore to pitch in the Lancers Invitational. We really looked for big things from him. Photo by Alan Herzberg, SportsPhotos LLC --- Michael Hinz earned first-team All-Greater Metro Conference honors, the only Lancer on first team. "His role is definitely our No. 1 pitcher, someone we know we can give the ball to where we are so confident you can pick up that vibe when the kids take the field," he said. "Going through our pre-game and after the National Anthem, they get fired up because they know he is going to be around the plate. They know he is going to give them the chance to win every game and the mindset he takes with him on the hill. He just goes after hitters." Bigler then talked about Hinz's approach. "I think he's a little unorthodox in the way he delivers the baseball," he said. He's not fundamentally perfect, but he replicates well. He doesn't do things differently. He's able to stay consistent with the location of his pitches more or less. He has a tremendous walk to strikeout ratio and walk per game ratio, which in high school he can not put a better formula together to win games and not walk high school hitters." Bigler the explained what he meant by unorthodox when talking about his delivery. "He has the limbs flying everywhere," he said. "The sidearm release points, the high leg kick. Because of his arm angle he drops down to the side a little bit. You just don't see that in high school. The slider away from you and the two-seam coming on your hands. It's tough for high school hitters to square up." Hinz's ability to throw strikes is also a key to his success. "Getting the first pitch over for a strike, getting ahead of the hitters, it's so important," Bigler said. "If you pitch from behind all the time, you are going to have issues. He goes right at people, whether he has to spin his slider for a strike or he throws a fastball for the first pitch, he's getting ahead of the majority of the hitters." 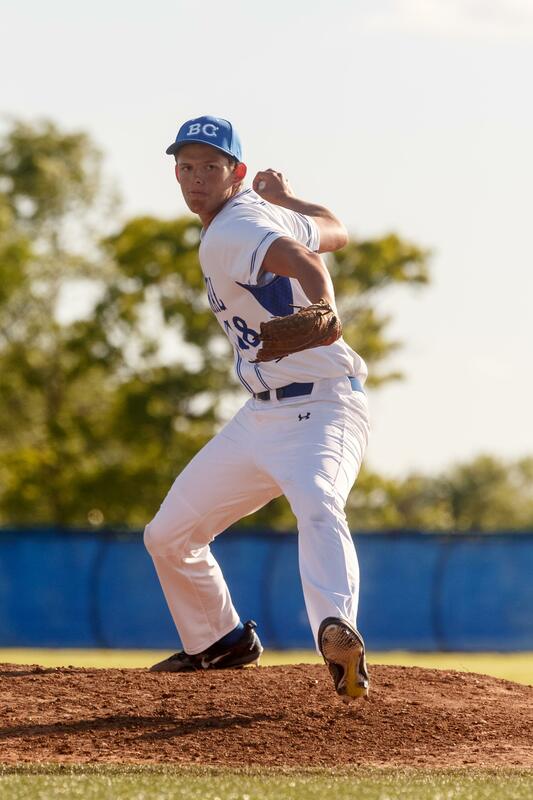 Photo by Alan Herzberg, SportsPhotos LLC --- Senior righthander Michael Hinz was 8-1 with a 0.94 ERA. Hinz brought up another part of his game which he feels strongly about. "Being able to hit a spot when runners are on," he said. "I'm usually pretty good at getting through the inning. If there are runners on second or third with an out, I usually can get a strikeout, get through tough innings. My composure on the mound is pretty good. After getting runners on I can usually shut it down." Hinz has been working on his game since Tee-ball when he was 5 years old. He tried out for the Brookfield Bulldogs then and that's where it started for him. He then played select baseball with the Wisconsin Wildcats through 7th and 8th grade. "My brother (Ryan), I remember watching him. He was really good," said Michael of his older brother who was a star for the Lancers and the Brookfield Bulldogs of the Land O'Lakes. "I kind of wanted to be like that. I loved the sport. It's not too overwhelming. I loved it from the beginning." 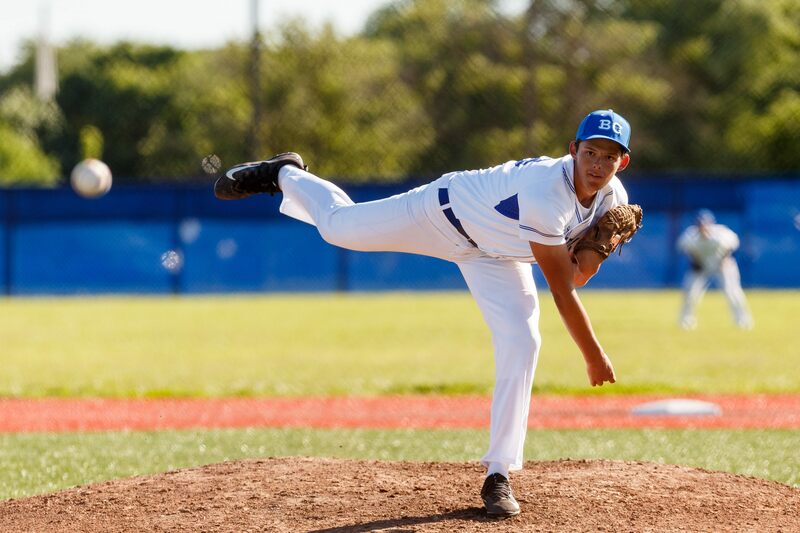 Hinz has a variety of pitches and good control, an excellent combination for any pitcher, let alone a high school hurler. He has a fastball, two seamer, and then a slider and he will occasionally mix in a changeup. "It's really the fastball (80-79 mph) and the slider that gets me," he said. "My fastball kind of tails down and it's tough to hit when they square up on it and the slider goes away from the hitter." Hinz credits catcher MJ Houdek with calling a good game. "MJ knows guys up and down the other team and he'll give me the scouting report," he said. "Sometimes there are 3-4 hitters who we'll try and work around them, work the corners. Towards the bottom of the order we'll go right at them." Hinz was one of six captains this season, something he is proud of. "It's extremely important," he said. "Going into the year, I thought 6 captains were a lot, but we have all different roles." Bigler described Hinz's leadership style. "He's a quiet lead by example guy," he said. "He's just got that bulldog mentality. The other kids feed off of it. Some kids don't wear their emotions on their face - and he does. "One of the first things I liked about what he did when I was taking him out of a game - and he had another hitter or two to pitch to to get out of the inning - he did not want to come out of the game. He got upset. He wasn't disrespectful. He handed me the baseball but he did not want to come out of that game. He wanted to finish. "He's such a competitor. I feed off that. The rest of our team feed off that. It's just fun to watch when you get out there. That's what it's all about. "It's about competing. When he gets out there, he just competes. It makes for an atmosphere that gets us all in that frame of mind." FAVORITE MOVIE: 'Fast & Furious series,' Action. WHAT DO YOU WANT TO DO IN THE FUTURE: Attend University of Wisconsin - Milwaukee and play baseball. UWM has given him a preferred walk-on offer for the fall.